We have reached our 700th orchid of the day! – it started as a challenge for a year and seems to have developed into something of an obsesssion – what would a day be without its orchid. For anyone who is worried, we can assure you that 365 days of orchids will not be affected by Brexit! 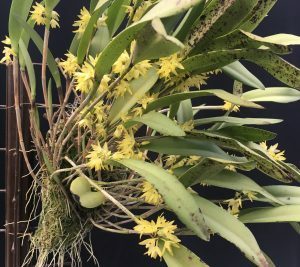 Octomeria densiflora is a fitting orchid for day 700. This is a beautiful species native to the Mata Atlantica cool cloud forests of Brazil and a species we found near Macae de Cima on our expeditions in 2001 and 2006 at around 1300m altitude. The flowers are small but are produced in profusion. The grey-green thick leaves are also very attractive. 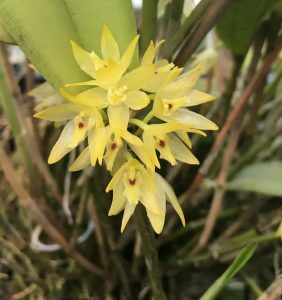 All of our plants have come from a single flask purchased from Equatorial Plants in 2001 and we regularly have small divisions for sale. The plants grow well in pots, baskets and mounted. We find that the mounted plants (such as these photographed) are the most floriferous but they suffer a little more with black spotting on the leaved from heat stress. The flowers are short lived but produce a dramatic display with the small plants smothered in flowers.